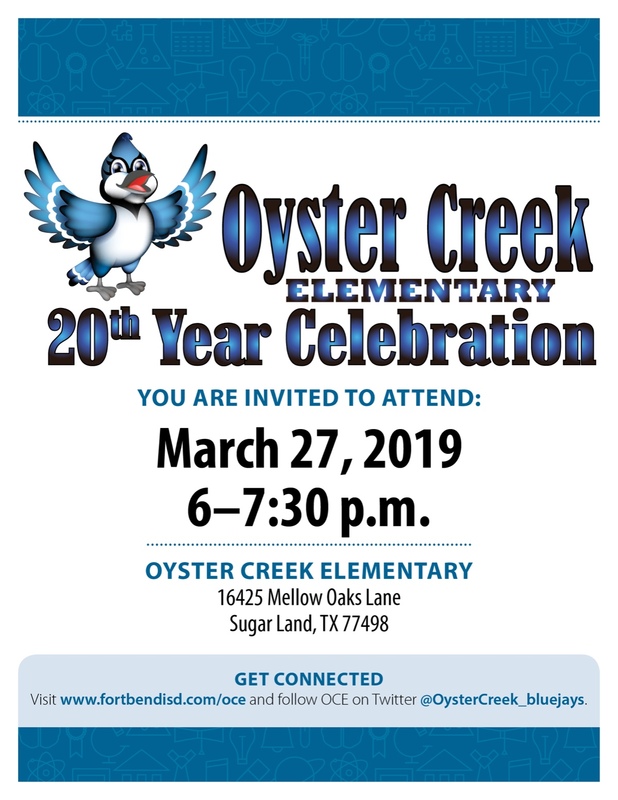 Oyster Creek Elementary is celebrating its 20th year anniversary on Wednesday, March 27, and the community is invited to attend. The celebration will take place on the campus (16425 Mellow Oaks Lane, Sugar Land, TX 77498), from 6 to 7:30 p.m. All former and current OCE students, teachers, staff, parents and community members are invited to join the celebration. The event will include appearances by former principals, choir performances, a walk down memory lane, a photo booth, music and more! For 20 years, OCE has proudly served its students, providing them with opportunities to learn with a commitment to excellence. The school opened in fall 1999 under the leadership of Principal Susan Wey and Assistant Principal Chris Winans. The school's current administrators are Principal Deanna Olson and Assistant Principal Constance Hawkins, and they look forward to welcoming the community to the celebration. Don't miss this opportunity to reconnect with former friends and colleagues and learn about current OCE successes and future plans. For more information about OCE's 20th anniversary, contact the school at (281) 634-5910. Your online community neighborhood for Sugar Land-area residents.